I just watched this TV movie, originally broadcast on ITV on 11th September 1988. This was an Eric Chappell play, transferred from the stage to TV. George plays an interesting character in this one called Vincent Vincent, which he openly admits is a fake name. 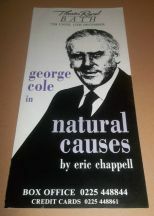 He works for a company known as 'Exodus', who specialise in bumping people off using poisonous potions, with the cause of death appearing as the title suggests, of 'Natural Causes'. This is very handy for those that want to be killed off with the minimum of fuss. As you watch this, it is so clear that this was written for the stage, with there being a series of acts, with a natural break between long key scenes of dialogue. 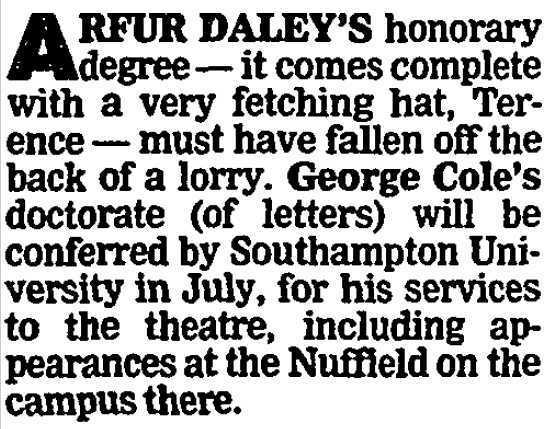 George stars alongside three very famous faces in this - Prunella Scales (whose character in this is a bit like Sybil Fawlty I have to add), Benjamin Whitrow (Braitwaite in 'The Sweeney' and a doctor in Minder's 'Life In The Fast Food Lane'). Then there is a young Leslie Ash, who I must admit looks incredibly fit in this. 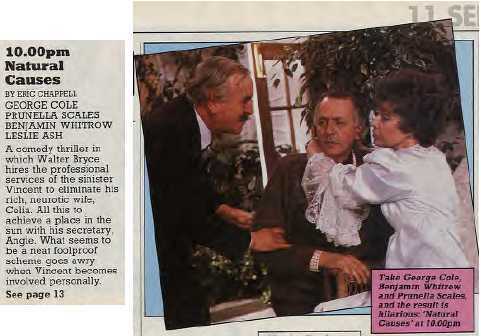 STORY: Vincent has been invited along to a house by a Mr Bryce (Whitrow), who has told him that his wife Celia (Scales) wants to commit suicide after a long period of depression. As Vincent always likes to cover his own back, he gets to know a little bit more about Mr and Mrs Bryce, as well Mr Bryce's young secretary Angie (Ash). Vincent soon realises there is more to this tale of depression than he first thought and decides to hang around a bit longer at the house to find out (and possibly earn) a little bit more. On the DVD, released by Madman down under, there is a very very short 30 second audio-only introduction by GC. In this he mentions he agreed to do the play as he thought it was hilarious, despite the fact it has dark undertones. 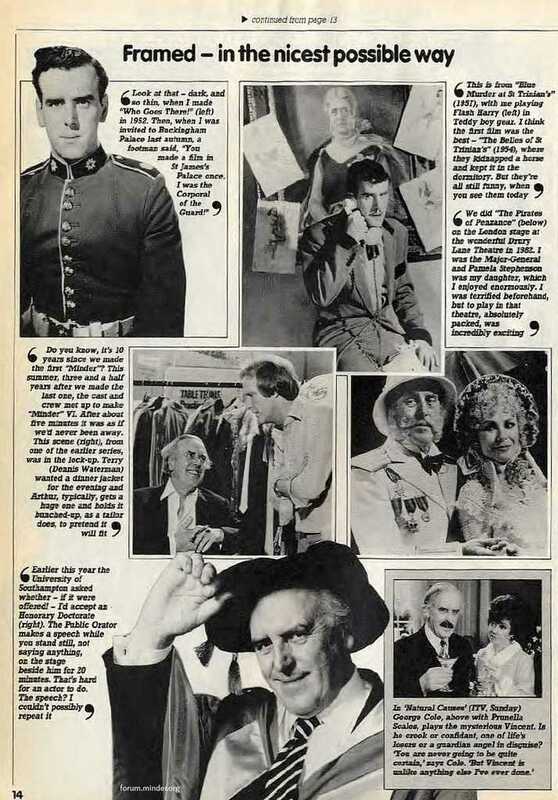 The DVD also has a lot of publicity stills from the production, including one of the whole cast together with Eric Chappell. Having just seen this for the very first time, I must say I can't totally agree with GC on it being hilarious. I didn't find it hilarious but it is certainly very enjoyable. The sheer quality of acting and famous faces on display here, together with a decent sort of script makes it very entertaining. It is definitely meant to be a dark 'comedy/drama of errors', though the switch from stage to TV production is a bit too evident I feel. It is 95% studio bound and at times I am not sure this 'stage production on TV' entirely works. In terms of laughs, well sad to say there were certainly no laugh out loud moments, but there is certainly an element of Arthur Daley in the Vincent character here which helps this along nicely. The humour is insinuated here, albeit though long bits of dialogue. It is GC for me, who makes the dull come to life though - his character Vincent is a very dubious old man, who we don't really get much background on, though it seems clear he will change his tune at the drop of a hat for an earner. There are even a few 'gorns' and one 'oh my gawd' I heard which is always nice to see. Personally, I think this should have been a bit better adapted for a TV production. In my honest opinion, at 1 hour 18 minutes it is arguably about 15 minutes too long, with too long a gap between something major going on. The adaptation for TV has clearly tried to cram in every aspect Chappell's script, which I think makes it longer than necessary. If this were on the stage it would be far more enjoyable and no doubt the hilarious that GC mentions in his introduction on the DVD. Despite the negatives here, GC is always an absolute delight to watch and with some Arthur-esque moments thrown in this is definitely worth checking out. 7/10 - GC on top form, despite this TV adaptation being just a bit too long I feel. 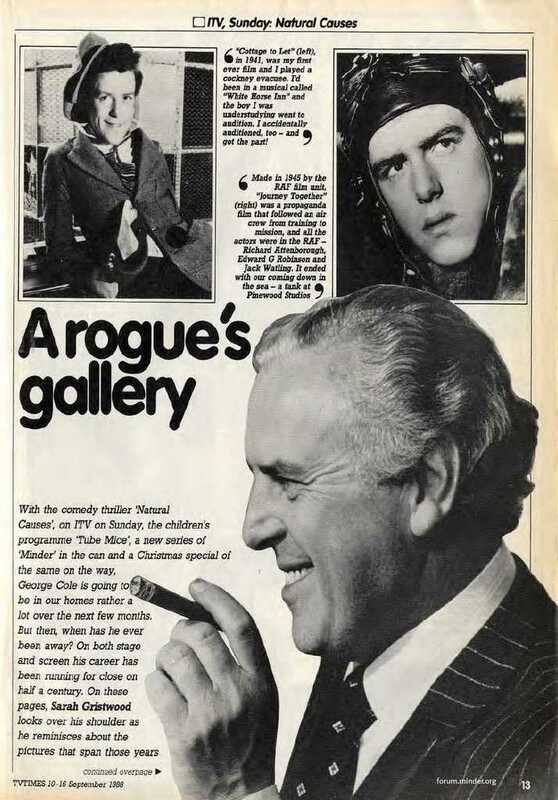 TV TIMES bits from the week this was broadcast, all about George Cole. 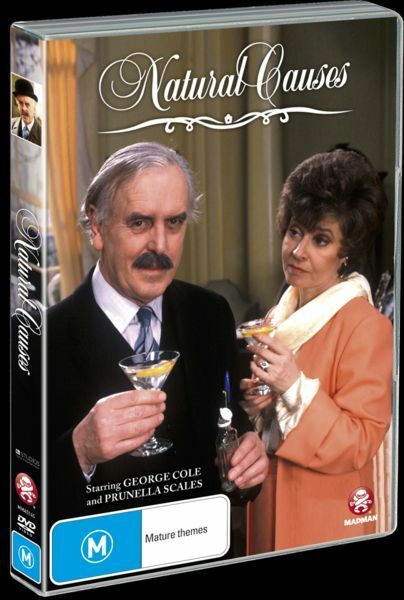 I can't get over how the DVD cover is like how George Cole is trying to hide how he's Arthur Daley with that tash like Arthur has finally made it. I see it is an Aussie cover with the ratings tagged on there. I think they were trying to be funny when they designed that front cover. Maybe smart. It doesn't make me want to jump in and watch the movie to expect something different, but it does make me think a little bit.